If you don't have even the smallest of the infield, and you want to pamper loved ones with his own grown vegetables, try a vegetable garden on the windowsill. Of course, it will differ from the usual look of the beds, but subject to certain agricultural technologies and from the garden on the windowsill, you can get quite a decent crop. To break in the apartment some kind of vegetable garden can be the case if at least 1-2 of the Windows face South or South-East. Most vegetable crops need a long Sunny day, only herbs and lettuce can grow from the Windows overlooking the other side of the world. Home vegetable garden needs a sophisticated system of irrigation and better irrigation. If you plan to go away for the weekend, decide how to make the garden on the windowsill is enough moisture. Another issue, common to all vegetable crops grown in the home garden – organization of the drainage system that protects the roots from excessive moisture and rotting. Producing the boxes, which will grow cucumbers, tomatoes, greens and other vegetable crops, provide holes for the release of irrigation water. Gives good results organization home garden in boxes lined with several layers of special material hydroponics. To grow at least relative to the harvest of cucumbers, it is important to choose for home garden on the windowsill is low self-pollinated varieties are fast maturing. Another point on which to focus, deciding to grow cucumbers – length lashes. The shorter the whip, the best agronomic practices to ensure the cucumbers. To sow their seedlings makes sense at the end of February – early March. In the phase of 2-3 true leaves to dive in separate boxes or in a container that is a window sill full. In this case, it is important not to sagomate planting: cucumbers home garden needs at least 20-30 sq. cm for normal development and fruiting. Trying to grow cucumbers on the windowsill, the first feeding lead through the week after the pick plants. Better if it will be potash fertilizers. Then once a week together with one of the waterings fertilize with a weak solution of humic acids. Consider trellising cucumbers. This should be done as if criss-crossing of cotton rope whip plants and tying her to a pole. When the cucumber reached a height maximum for your window, priderite growth point. They will no longer grow, but this technique will help to ripen the ovaries already present on the cucumbers. Harvest in the morning hours. It is believed that this will also contribute to the early aging of the remaining Bush on the ovaries of cucumber. Tomatoes need a window facing South. They are more of other vegetables grown on the windowsill, need continuous and uniform lighting. The main thing you'll be farming tomatoes home garden from the above-described farming cucumbers – the frequency and intensity of watering. Water tomatoes need more watering but spending is much less and only at the root. Planning a vegetable garden growing on the window sill, be prepared for frequent ventilation of the apartment. Self-pollinating varieties of tomatoes, there are few, rest for a good harvest the necessary pollinating insects. If a few of them in one day in the morning tear off some male flowers and touch the pistils of female flowers. In most cases, this technique helps to make the pollen, and it have the best impact on the yield of your vegetables. At the stage of the third true leaf tie up the plants to sustainable pegs, otherwise there is a risk of breaking the stems. Tomatoes on the windowsill make no more than two guns. Without regret discard the shoots – they take away power from the ensuing fruit, preventing their growth and maturation. 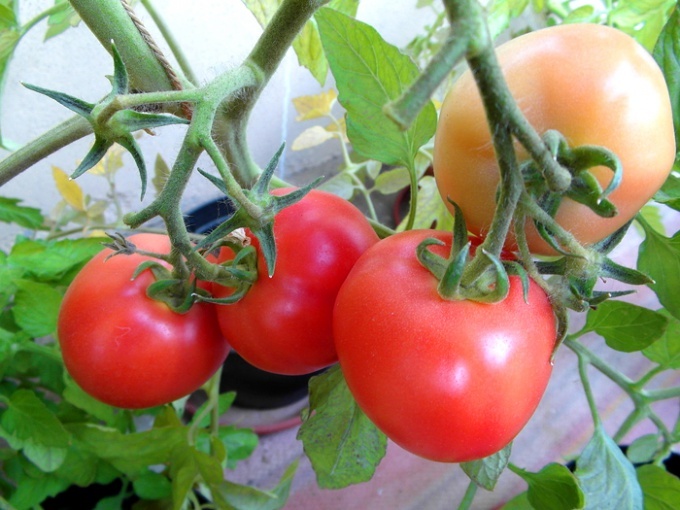 Feed the tomatoes twice in a season: two weeks after pricking the seedlings (if the pick is not held, then in the phase of 2-3 true leaves) and time of maximum fruiting. For feeding take the solution of trace elements, add potash and phosphate fertilizers, pre-dissolve them in warm water. Your garden will thank you and answer a good harvest of home-grown vegetables.